Caribbean Mayan Hammocks bring style and relaxation to any location. 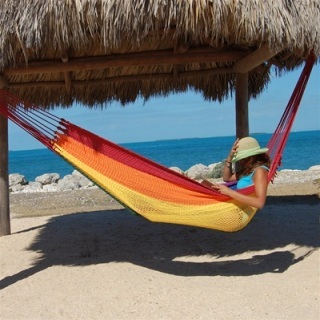 Our Caribbean Mayan Hammocks are hand-woven from soft spun polyester. 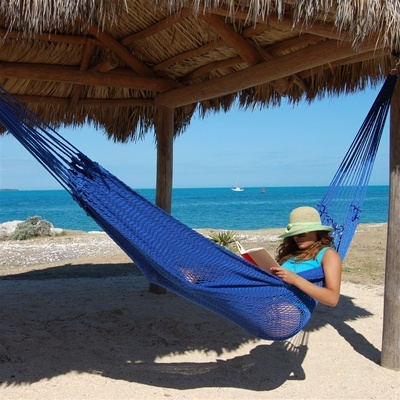 Unlike similar cotton hammocks, they will not rot, mold or mildew. The hammock bed is woven with an extra tight micro-weave design providing the ultimate in comfort and stability. This hammock hangs easily from two suspension points at least 12.5 feet apart. These are the largest and most comfortable Mayan hammocks anywhere. Selecting the multicolor hammock indicates the colors will be random and may be different than the color scheme in the image. The hammock suspension hardware and hammock stands are sold separately. Caribbean Mayan Hammocks are made of polyester. This hammock color is Red. Caribbean Mayan Hammocks are made of polyester. This hammock color is Tan. Caribbean Mayan Hammocks are made of polyester. This hammock color is Rainbow. 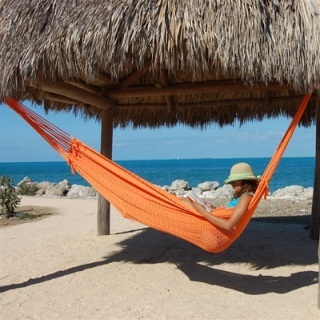 Caribbean Mayan Hammocks are made of polyester. This hammock color is light blue. Caribbean Mayan Hammocks are made of polyester. This hammock color is Caribbean Blue. Caribbean Mayan Hammocks are made of polyester. This hammock color is green. Caribbean Mayan Hammocks are made of polyester. This hammock color is Yellow. Caribbean Mayan Hammocks are made of polyester. This hammock color is Mocha. Caribbean Mayan Hammocks are made of polyester. This hammock color is Orange. Caribbean Mayan Hammocks are made of polyester. This hammock color is purple.